This report contains the full transcript of an interview conducted during March 2013 in Dwe Lo Township, Papun District by a community member trained by KHRG to monitor human rights conditions. The community member interviewed Saw A---, a land owner in G--- village, near where a deadly landmine explosion occurred. Saw A--- described how a landmine killed five workers, including three children, who were transporting sand for the Green Hill Company, which is affiliated with Tatmadaw Border Guard Force (BGF) Battalions #1013 and #1014. More information relating to this incident, including details from a different interview about company compensation for the families of the deceased villagers, can be found in "Violent abuse and forced labour in Bu Tho Township, November and December 2012," KHRG, July 2013. The following interview was conducted by a community member in Papun District, and is presented below translated exactly as it was received, save for minor edits for clarity and security. This interview was received along with other information from Papun District, including two other interviews, two incident reports, one situation update and 50 photographs. My name is Saw A---. How old is the youngest child? The youngest child is three years old. I'm a flat field farmer. What is your village name? I used to live in Na Kyaw before, but later I moved to G---. Are G--- and P--- village the same village? Yes, in Burmese they call it P--- village, and in Karen it is G---. Which village tract is G--- located in? G--- is located in K'Ter Tee village tract. What township is K'Ter Tee village tract in? K'Ter Tee village tract is in Dwe Lo Township. I heard that in your area there was a problem that occurred recently. What problem was it? The problem was the explosion of the landmine. We also didn't know clearly at first. They said they [the company and sand collectors] would come to collect sand, and we told them that if everything is fine between them, it is fine for them to come and collect sand. We told them that we wouldn't stop them from collecting sand from our area as they really needed it. They told us that we wouldn't have to worry about the other armed groups. Everything would be fine if we just accepted them collecting sand. We talked to Ko Myo from K'Ter Tee [K'Taing Tee] because he was the one who led people in collecting sand in our area. He also brought a manager from a company with him. Do you know the name of that manager? Yes, the company manger's name was Zaw Lwin. Do you know the company's name? No, I don't know the name of the company. Did Zaw Lwin take the sand from Ko Myo? At first he [Zaw Lin] came to collect sand by himself, but later he heard that the company couldn't come and collect sand [on account of villager wishes], and later he made the agreement and signed that he wouldn't come and collect it anymore. But he took [sand] from Ko Myo, and Ko Myo started to collect sand [instead]. When he started collecting sand, he told us that he was collecting it for building the school. So, we told them that if he already negotiated it with the other armed group that it was fine for them to collect the sand. Was there any problem when Ko Myo collected the sand for the school? There was not any problem because he went to see with the vice village tract leader and discussed it with them. Which vice village tract leader did they go to see? They went to see the K'Ter Tee village tract leader. What did the vice village tract leader tell them? The vice village tract leader told them to stop collecting sand. But they did not stop. Did they pay you anything for the sand that they collected in your area? I only knew that they paid 600,000 kyat (US $613.50). There are many farms that they collected the sand from, so he only paid a very little amount to each of the owners. I have received 200,000 kyat (US $204.50). They have been collecting the sand from my farm since last year. Our farms have already been damaged so it is kind of [like] they wanted to compensate [us for the damages]. Are you the land owner? Was there any problem between Ko Myo and you as a land owner after the explosion? There was not any problem. There was not any problem because I already told them at the beginning that if they had negotiated [between Ko Myo and the armed groups] with each other, everything would be fine with me. I already told them that I wouldn't take responsibility regarding the armed groups. They wanted to collect sand in my land, and I let them collect it, but I told them that they should talk to the armed group first. If the armed group is fine with that, I'm also fine. 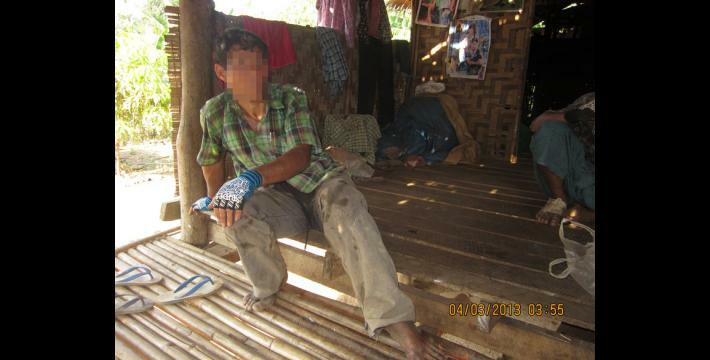 Was there any warning, especially to Ko Myo, before the landmine explosion? Yes. People warned him but he didn't take it seriously. Was there anyone else that Ko Myo worked together with? I don't really know about that. Who do you think the perpetrator of the landmine explosion is? I don't know about that. But I think the explosion was not perpetrated by the villagers. So, I think it could be one of the armed groups. Which armed group was it do you think? I can't even take a guess. I don't know which group it was because there are so many armed groups. What day did the landmine explode? I don't remember the exact date that it exploded. How many days ago was it? I think it was over a month ago. So, was it a month ago? Yes, it was over a month ago. It was in early 2013. Yes, five people were injured. Three people died immediately when the landmine exploded and another one died on the way to the hospital, while the fifth person died in the hospital. Were there any women among the five people who died? Was there anyone who was under 18 among the five people who died? Three people were under 18. Where did the landmine explode? It exploded at the source of the river [Yunzalin River]. What is the name of this village [the village in which they're conducting the interview]? The name of the village is G---. Did it explode in G---? Actually, it exploded between T--- village and G--- village. Which village tract are these two villages in? They are in K'Ter Tee village tract. Which township is K'Ter Tee village tract in? Was the place where the explosion happened closer to G--- or T---? Neither of them is closer. It just happened halfway. Do you know exactly who the perpetrator was? I don't know because the perpetrator also didn't tell us anything about their [intent]. It just exploded suddenly. Do you know which armed group was it? How far is the explosion place from the vehicle road? I think it is about two furlongs [0.25 miles/ 0.4 km] far. How far is the Tatmadaw army camp from the explosion place? I think it is one furlong far [0.125 miles/ 0.2 km]. 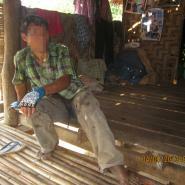 Do you think the perpetrator targeted the Tatmadaw with the landmines? I don't think so, because when Ko Myo came to collect sand the Tatmadaw didn't come with him. And the sand collectors are villagers who do daily wage [labour]. They are hired daily to collect sand. There were no Tatmadaw soldiers, so I don't think the perpetrator intended it for them. I think the perpetrator only intended to damage the car. Why did they want to damage the car? I also don't know about that. So, you think the perpetrator wasn't targeting the Tatmadaw with the landmine? Yes, I don't think so, because the Tatmadaw soldiers didn't come together with the sand collectors. The sand collectors are just villagers. So, it didn't relate to the Tatmadaw. Do you have anything else that you want to say and I haven't asked you? No, I don't have anything else to say. Can I report the information that you provided for me to media groups? Yes, you can, because everything I told you is the truth. In order to increase the transparency of KHRG methodology and more directly communicate the experiences and perspectives of villagers in eastern Burma, KHRG aims to make all field information received available on the KHRG website once it has been processed and translated, subject only to security considerations. As companion to this, a redesigned website will be released in 2013. In the meantime, KHRG's most recently-published field information from Papun District can be found in the report, "Violent abuse and forced labour in Bu Tho Township, November and December 2012," KHRG, July 2013. Although the villager does not specify in this interview, it is likely from corroborating information received by KHRG that he means the Tatmadaw BGF and KNLA. Manager Ko Myo secured permission from the BGF for the Green Hill Company, which is affiliated with BGF Battalions #1013 and #1014, to collect sand. According to an unpublished incident report written by a community member from Papun District, Ko Myo did not, however, receive permission from area KNU/KNLA representatives to undertake these efforts. As of July 11th 2013, all conversion estimates for the Kyat in this report are based on the official market rate of 978 kyat to the US $1. A furlong is a unit of distance equivalent to 0.125 of a mile or 0.2 of a km.